The traditional mountain holiday village of Morzine is situated in the middle of one of the most extensive ski areas in the Alps, the Portes du Soleil, which links 14 ski resorts in France and Switzerland. The area offers hundreds of miles of off-piste terrain and groomed slopes, and runs up to seven miles (11km) long, spread across 14 valleys. It is a great family resort with traditional chalets, special childcare services, and plenty of beginner and intermediate slopes in the vicinity, as well as family-orientated activities. Advanced skiers and boarders will also find endless off-piste opportunities and ample challenges on the black slopes. About a mile higher up the slope is the purpose-built resort of Avoriaz, which is a popular base for trips across the border to the Swiss resorts, and its treeless slopes offer powder snow and great boarding. The unlimited ski area of the Portes du Soleil offers slopes for all levels of skiing and snowboarding at the foot of the Dents du Midi and the Dents Blanches, with wonderful panoramic views. The terrain covers about 404 miles (650km) of marked runs, making it the largest ski area in the world. Both Morzine and Avoriaz have nursery slopes next to the resort, while intermediates have a playground of vast proportions in the Morzine area as well as throughout the Portes du Soleil circuit. Advanced skiers and boarders will find more than 20 black runs, endless off-piste and some of the biggest moguls in the world on the legendary 'Wall' at Avoriaz. Avoriaz is also one of Europe's top snowboarding destinations. Ski schools offer lessons to all ages from three years up, for all levels. Holidaymakers will find a variety of local handmade goods and typical French souvenirs displayed in shop windows in Morzine, such as traditional Savoyard pottery, sculpted objects made from the local wood and slate, mountain cheeses and salted meat. There are also fashion boutiques and sports shops. Morzine specialises largely in fully catered chalet-style holidays, but for those looking for a night out there are a variety of options available. Traditional fare such as raclette, fondue, berthoud or diots can be found in a number of establishments. Meals are well accompanied by local wines. Après-ski is generally low-key and relatively calm, but several bars and discos in Morzine offer a bit of after-hours entertainment for holidaymakers keen on a big night out. There are a variety of bars and English-style pubs, though many close as early as 8pm, and a couple of nightclubs that stay open late. Most clubs are closed around 2am. 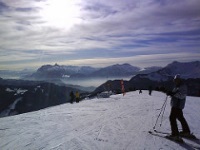 A wide range of activities is offered to holidaymakers, both on and off the slopes in Morzine. Cross-country skiing, night time sledging and sleigh rides, snowshoeing, paragliding and winter walks are some of the activities available. For something different, adventure parks offer a circuit made of ladders, swing bridges and zip wires between the trees, or try kite skiing and snowboarding. Other attractions include a visit to the slate mines or watching a cheese-maker in action. A sports hall has a fitness centre and ice-skating rink. The low altitude of the resort means that resort-level snow is rare and there may be a wait at the lifts to access the mountains.